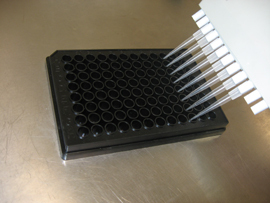 Hydroxyproline Assay Kit | Cell Biolabs, Inc. The amino acid hydroxyproline is synthesized through the post-translational modification of proline by prolyl hydroxylase. Hydroxyproline is found almost exclusively in collagen and measured hydroxyproline levels correlate to the levels of collagen present in the sample, which can indicate diseases involving collagen breakdown. Our Hydroxyproline Assay Kit is a quantitative colorimetric assay for measuring the hydroxyproline concentration in protein samples. Hydroxyproline in acid hydrolyzed samples is converted to pyrrole through a reaction with Chlormine T, which then reacts with Ehrlich’s Reagent to form a chromophore that is detected at 540-560nm. Hydroxyproline levels in samples are calculated based on a hydroxyproline standard curve. Liu, H. et al. (2016). Cholesterol 7α-hydroxylase protects the liver from inflammation and fibrosis by maintaining cholesterol homeostasis. J Lipid Res. doi:10.1194/jlr.M069807. Park, H. J. et al. (2016). Roflumilast ameliorates airway hyper-responsiveness caused by diet-induced obesity in a murine model. Am J Respir Cell Mol Biol. doi:10.1165/rcmb.2015-0345OC.